We are a consulting and diagnostic company, independent from manufacturers and suppliers. We serve only one master: YOU. We offer our remote services such as computer simulations, and drawing reviews worldwide, while those diagnostic services which require transportation of bulky equipment are limited to the Southeastern U.S. More about us. We contribute our experience to peer reviews of construction documents. We review documentation for constructability, compliance with applicable codes and standards, and the current level of building science knowledge. We also produce technical building enclosure design drawings and specifications that become part of architectural construction documentation. Since our successful promotion "Free Documentation Review" last year, we made it our regular policy to leave the payment decision up to our clients. If we did not save you money or face, then the review was complimentary. We also provide second-opinion reviews on sets reviewed by our competitors. Contact us at your convenience and one of our representatives would be happy to help you. Our European technical design experience, bridging the gap between the architectural design and submittals, makes us a proactive partner in a design team exploring new horizons and pushing the edge of a facade design. We have confidence in our opinions based on the solid fundations of the European Facade Engineering and we are not afraid of the paper track; paper is the chief media of the design. This attitude sets us apart from our reactive and risk-averse competitors. Architects don't like to listen about limitations of a typical design; they prefer to push the edge of THEIR design, unlike any others. They prefer to have a partner who instead of whining challenges them with the newest research and engineering, opening their eyes to the possibilities that they have not dreamed of yet , even if these options may be eventually discarded on the altar of economic or programmatic compromises. We collect data in the field, conduct field observations, perform quality tests, review submittals, and monitor construction in progress for conformance with the approved submittals and good industry practices. In the field, we provide standarized, traceable reporting, and periodically generate list of outstanding items. Construction progresses quickly, and nobody benefits from a report filed after the condition has been already concealed. Therefore, we exercise the proactive approach by informing the respective contractor about the discovered problem and offering assistance in developing mitigation plans. We also help contractors, and owners identify unclear design intent requiring a request for information (RFI) and assist architects in responding to RFIs. We collect data in the field, conduct field observations, perform quality tests, causation and condition assessments, perform simulations of failures, and recommend remediation procedures and materials. We also contribute our knowledge and experience to solve disputes among parties of construction process and serve as expert witnesses. 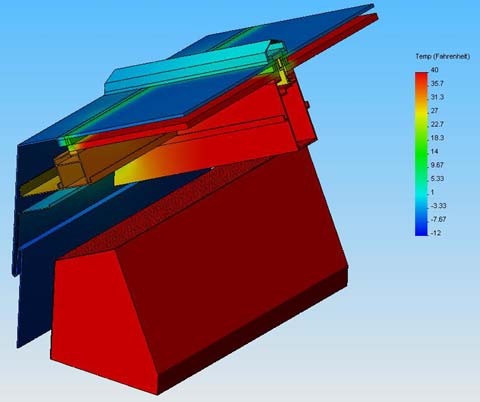 Computer simulations of failures and damage Read more. Finding visual match for broken glass Read more. We assist adjusters and attorneys in evaluation of casualty & property damage. We conduct cause & origin observation and analysis, as well as determination of code requirements with regard to the repairs and alterations of grandfathered buildings. We separate damage from pre-existing conditions. 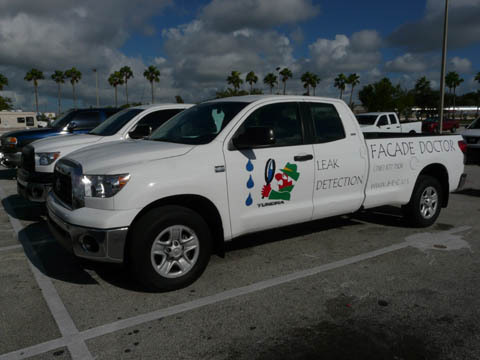 We perform like-kind repair analyses and preliminary cost estimates, particularly in those areas which are known to be poorly covered by standard estimating tools such as Xactimate. We are experts in architectural glazing, which is the frequently misrepresented area. We understand insurance policies language, having insurance adjuster's training. We also peer-review work of others. The interested reader may be interested in our complimentary article titled "How To Write and Read a Forensic Report. Review of Typical Issues and Solutions Associated with Engineering Assessment Reports." This article is intended for education and amusement of both authors and recipients of reports describing deficiencies of building enclosures. It may also prove useful in other areas of expertise, as number of issues are fairly universal. We provide takeover assessments and construction defect observations and analysis. We review building documentation, verify code compliance with the code in effect when building was permitted, and identify applicable standard of care. We present our findings in a way understandable to laymen. We also provide architectural restoration design and reserve studies. The interested reader may be interested in our complimentary article titled "How To Write and Read a Forensic Report. Review of Typical Issues and Solutions Associated with Engineering Assessment Reports." We assist designers and attorneys in analysis and presentation of physical processes before or after these processes occurred in the buildings. Many of these state-of-the-art computer generated analysis are unique worldwide. 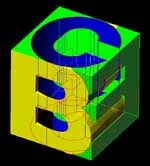 E.g., we are recognized as a world-class leader in the field of 3-dimensional computer simulations. We are a direct provider, which is the reason why our prices are low and quality is high. Read more. We established enviable reputation in curtain wall design and engineering. We analyze architectural designs for client's performance objectives, and match with systems available on the markets. We also optimize an existing design or engineer a new system from a scratch if necessary to meet project requirements. Due to our intimate knowledge of many proprietary facade systems, we are known for careful detailing of transitions between each two facade systems, to assure the established performance criteria are met at these traditionally weakest locations. We specialize in unusual cases, such as two-directional curvatures, non-conservative infill and framing materials, performing feasibility and availability research and engineering simulations. We refer the interested reader to our relevant publications. Sloped Glazing and Skylights combine two challenges: of a curtain wall and a roof. We found sloped glazing and skylights to be universally misunderstood by designers, engineers, manufacturers, and installers. Not surprisingly, in our experience they are also the #1 problem assembly in buildings, ranging from water condensation and leakage to structural collapses. We investigated such prominent cases as the collapse of a monumental skylight above a courtyard of an upscale hotel in Maryland, which made headlines several years ago. 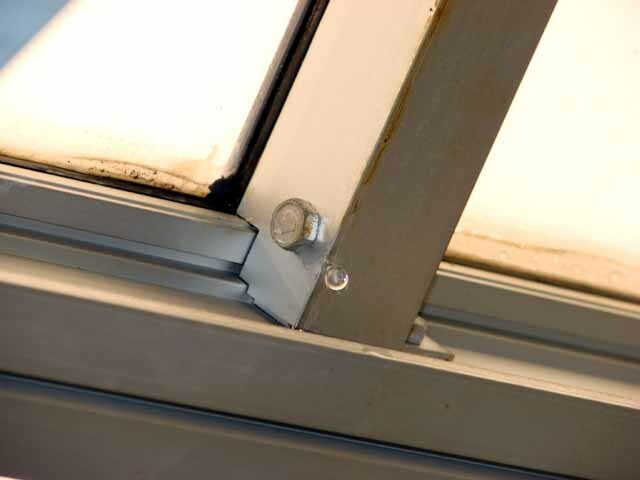 Sloped glazing and skylights are a good example of assemblies where the source of leak may be obvious; however, you still need an expert to identify the REASON of the leak and come up with a working remedial design. This is why we devoted a separate line of our business exclusively to sloped glazing. We teach designers how to design and specify them, we help design them, and we investigate them in the field. 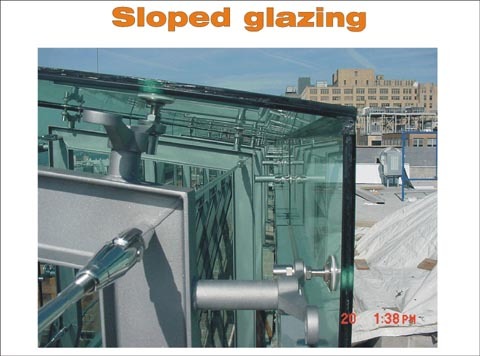 We refer the interested reader to our seminar titled "Sloped Glazing." We perform two types of tests: in the real world and in the virtual world. For the latter, please see the our webpage dedicated to computer simulations. Thermal imaging of building envelope assemblies, by ASTM C 1060 "Standard Practice for Thermographic Inspection of Insulation Installations in Envelope Cavities of Frame Buildings,"
ASTM E783 "Standard Test Method for Field Measurement of Air Leakage Through Installed Exterior Windows and Doors,"
AAMA 501.2 "Quality Assurance and Diagnostic Water Leakage Field Check of Installed Storefronts, Curtain Walls, and Sloped Glazing Systems,"
Thermal imaging for wet materials, insufficient or wet insulation, and air leaks, following the ASTM standard C1153, titled "Standard Practice for Location of Wet Insulation in Roofing Systems Using Infrared Imaging,"
Hydrostatic pressure (flood) tests for roofs and waterproofing ASTM D5957 "Standard Guide for Flood Testing Horizontal Waterproofing Installations,"
Air leakage tests using "blower door" fan pressurization ASTM E779, and ASTM E 1827 "Standard Test Methods for Determining Airtightness of Buildings Using an Orifice Blower Door,"
Sealant pull tests by ASTM C1193 "Standard Guide for Use of Joint Sealants,"
Coating pull tests by ASTM D 4541 "Standard Test Method for Pull-Off Strength of Coatings Using Portable Adhesion Testers,"
Spectrophotometric (UV-VIS-NIR-IR) Testing of Materials. Adhesion strength of adhesives and coatings. Download our scope of services: design, simulations and tests, construction, forensic, and education. 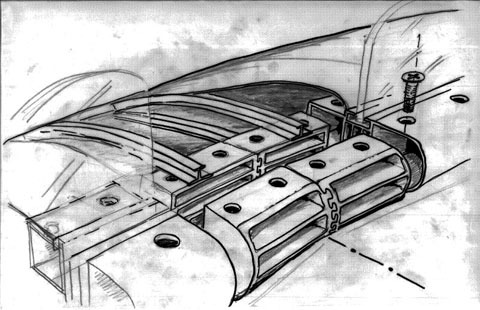 Sketches of a "knuckle" connection of a faceted facade's curtain wall transom integrated with a curved, shading "eyebrew." Architectural expression of the facade would be strongly influenced by the technical solutions supporting its curvature. 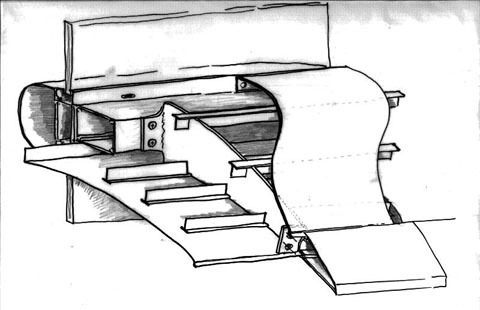 Hand-sketched by Kaz during discussions with the architect and prospective curtain wall providers. Construction monitoring of a torched SBS roofing installation. Computer simulations. 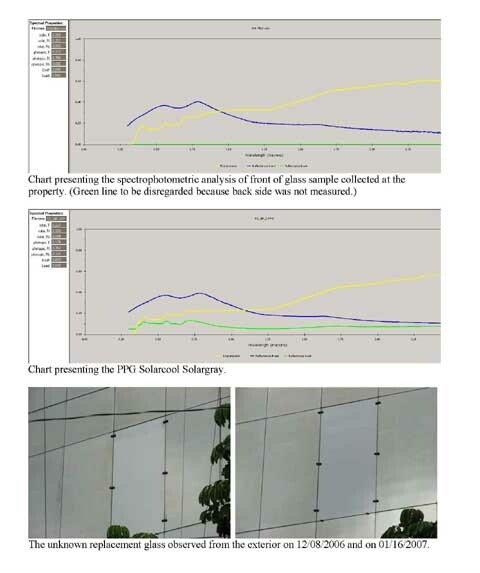 Example of spectrophotometric simulations performed to find the closest match for the replacement of an absolete broken glass. Computer simulations. 3-Dimensional Steady State Thermal Analysis performed as verification of freezing and condensation risk. Field t est. following the AAMA 501.2 “Quality Assurance and Diagnostic Water Leakage Field Check of Installed Storefronts, Curtain Walls, and Sloped Glazing Systems” procedure. 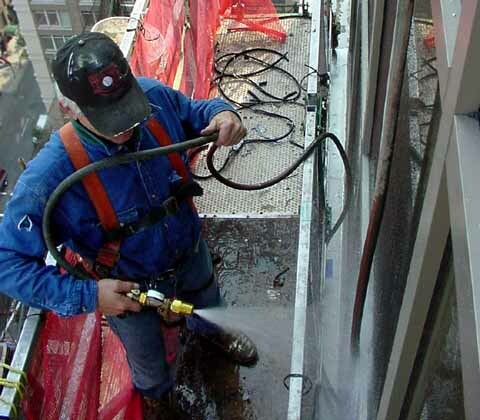 Building Enclosure Consulting owns a state-of -the-art specialized equipment used for building enclosure investigations and testing, with which we serve the east half of the U.S.
Seminar on Facade Engineering with Glass. 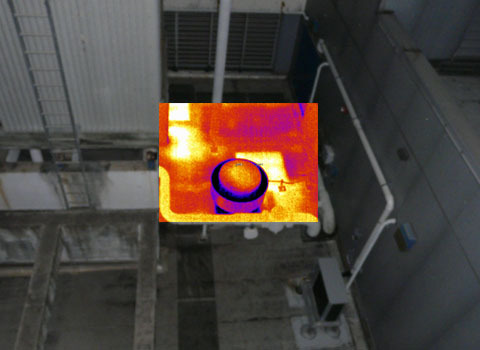 Practice for Location of Wet Insulation in Roofing Systems Using Infrared Imaging." 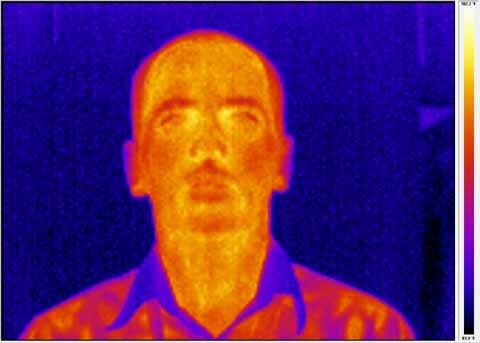 The heat stored in wet roof insulation can be detected after sunset with a thermographic equipment, producing spectacular results.